Image caption Theresa May met Donald Tusk in Downing Street last year. The European Council president told the European Parliament that in the Brexit talks "a no deal scenario would be bad for everyone but above all for the UK". He said the "goal is a smooth divorce" with the UK and EU as "good friends"
What is Article 50 and what happens next? He told the last meeting of the European Parliament before the UK triggers Article 50 that it was "carefully preparing" for Brexit and "it is our wish to make this process constructive and conducted in an orderly manner". But he warned: "However, the claims, increasingly taking the form of threats that no agreement will be good for the UK, and bad for the EU, need to be addressed. "I want to be clear that a 'no deal scenario' would be bad for everyone, but above all for the UK, because it would leave a number of issues unresolved. "We will not be intimidated by threats - and I can assure you they simply will not work. "Our goal is to have a smooth divorce and a good framework for the future - and it is good to know that Prime Minister Theresa May shares this view." 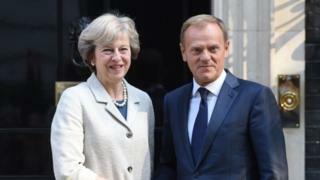 Mr Tusk also stressed that he would "do everything in my power to make sure that the EU and the UK will be close friends in the future", adding that "Britain will be dearly missed as an EU member state". "At the same time, I would like to stress again that the EU's door will always remain open for our British friends," he said. In Westminster meanwhile, Brexit Secretary David Davis told the Commons Exiting the European Union committee he had yet to "quantify" the impact of leaving the EU without a deal. "I have a fairly clear view of how it will work out, I just haven't quantified it yet. We will get a quantification later on, but it is quite plain how it will work out," he said. Mr Davis told the MPs it was right to assume leaving the EU without a deal would involve trade tariffs. Pressed on whether this would be a good thing, he said: "At this stage, until we have worked out all the mitigation procedures, we could not quantify the outcome." He said this would not be as good as the free trade deal the government was seeking with the EU, but was "not as frightening" as some people think. The Brexit secretary said it was "very important" that the negotiations are "as far as possible amicable". "There will be times when the negotiations will get tough I am sure, but tough does not mean spiteful, angry, whatever you want to choose," he said. Mr Davis said EU nations should be allowed a "considerable amount of slack" because they are disappointed the UK is leaving. But Labour's shadow Brexit secretary Sir Keir Starmer claimed Mr Davis's comments proved the government had "made no assessment of the economic impact of the prime minister failing to secure a deal". "What's clear, from the CBI and others, is that there is no result that would be worse for the British economy than leaving with no deal," he said. "No deal would be the worst possible deal. The government should rule out this dangerous and counter-productive threat before Article 50 is triggered." The Lib Dems said the government's position on no deal being reached was "the equivalent of driving towards a cliff-edge with a blindfold on". Scotland's First Minister Nicola Sturgeon says she wants to ask the UK government for permission to hold a second referendum on Scottish independence to protect the nation's interests in the wake of the UK opting to leave the EU. She said the Brexit vote has left Scotland at a crossroads, with an independence referendum needed to allow the country to choose which path to take. Mr Davis said the government had promised to seek an agreement with Scotland on its Brexit strategy. "If one side doesn't want to agree there is no way 'seek to agree' can turn to 'agree'," he added. The minister also said he expected the European Union (Notification of Withdrawal) Bill, which cleared the Commons and the Lords earlier this week, to receive Royal Assent and become law on Thursday. The new law will give Theresa May the power to invoke Article 50 of the Lisbon Treaty and trigger formal Brexit negotiations - a move she is expected to make by the end of March.